There was a hush over the market yesterday as – for the first time that anyone could remember – Gina’s Restaurant was closed on a Sunday, following the sad news of Philip Christou’s death that morning. Today, I am republishing my portrait of Gina & Philip Christou as a tribute to this remarkable couple who served the people of Spitalfields since 1961. In recent years, if you were looking for a Sunday roast in the East End then you could do no better than to go along to Gina’s Restaurant at 17 Bethnal Green Rd where Gina & Philip Christou opened just one day a week out of loyalty to their longstanding customers, many of whom had been coming since Gina & Philip first opened in Brick Lane in 1961. Gina & Philip found themselves at the centre of a self-supporting community. 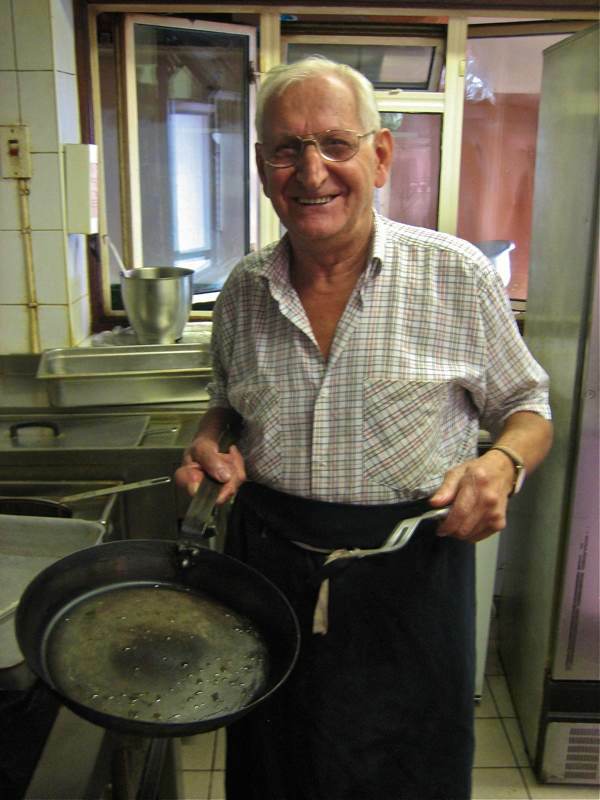 “I couldn’t afford a van, so the chicken shop across the road leant me their bicycle to go to Smithfield Market each morning to buy chops, steak and sausages, and I used to be back by six thirty to open at seven every day.” Philip remembered fondly, amazed at his former vitality. On the basis of their new-found income, Gina & Philip were able to buy a house in Haringey, permitting extra space for their growing family of four children – exceedingly fortunate, because in 1972 the council served a compulsory purchase order on the restaurant to demolish it. “I cried when we had to leave!” declared Gina with a helpless smile, confessing the lachrymose parentheses to her sojourn in Brick Lane. 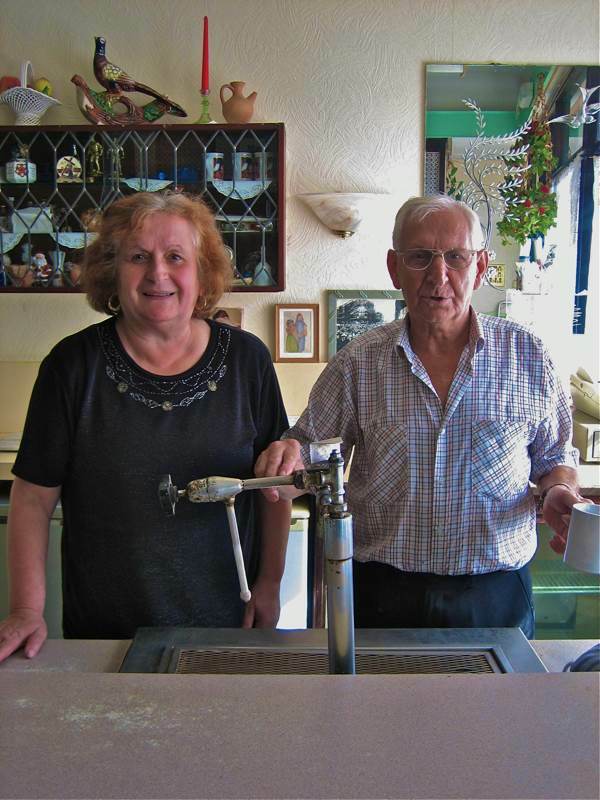 Gina & Philip borrowed money from the bank to buy the cafe in the Bethnal Green Rd and all the regulars from Brick Lane and the long-distance lorry drivers followed them – especially as they now offered bed and breakfast above the cafe too. When they arrived, the Sunday animal market was still in full swing, filling the surrounding streets, selling birds and all kinds of creatures – “We bought a goat and called it Billy, but the neighbours complained about it eating their cabbages and we had to give it back,” Gina told me, as an aside. They originally opened up as G’N'T’S, changing it to “The Steakhouse” on a whim, only to discover this attracted a crowd that was too posh, which led to the ultimate incarnation as Gina’s Restaurant. 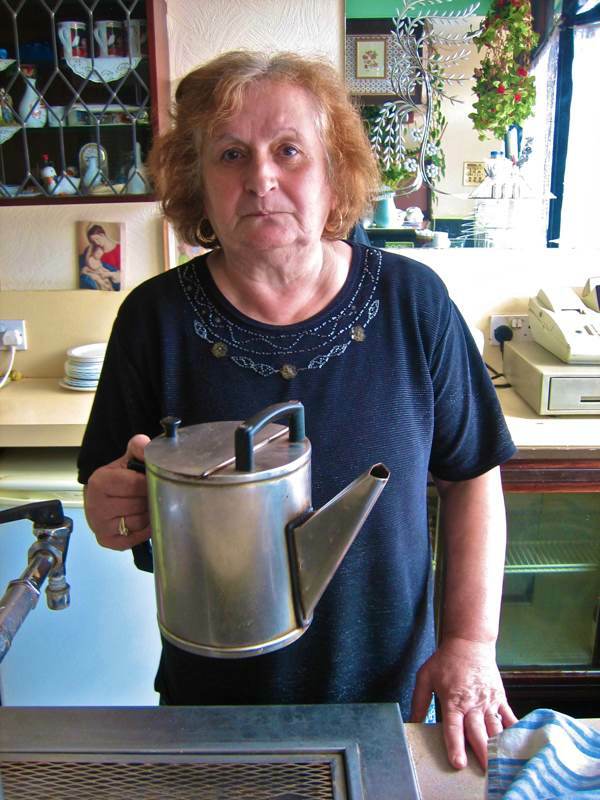 Sundays at Gina’s Restaurant – with Philip in the kitchen and Gina behind the counter – were a long-standing ritual in this corner of the East End, the focus of a particular world and one of the last places you could get a good cup of tea for 80p. Gina told me that many of the fly-pitchers who trade on the pavement outside – constantly hassled by council officials – are pensioners who have lived their whole lives in the neighbourhood and come to sell a few of their possessions simply to afford a Sunday lunch. Gina & Philip always opened every weekend to offer a safe haven to these people, and to anyone else that wanted an honest roast dinner. Philip with his favourite frying pan. Gina with her favourite teapot. 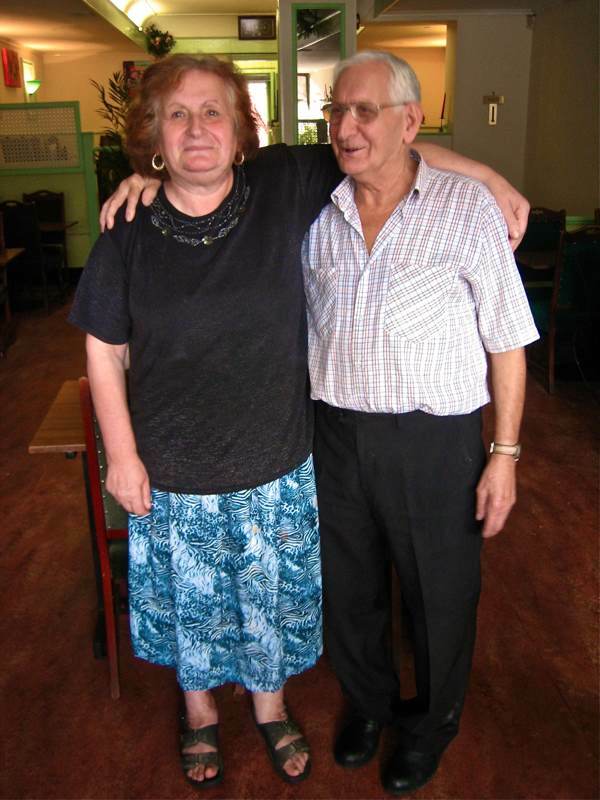 Gina & Philip Christou in their restaurant. I feel like I knew Gina and Philip. What a lovely couple. RIP to a wonderful man. What a wonderful piece. Thanks for sharing about this wonderful couple. So long Philip, and my heartfelt best wishes of comfort going out to Gina and the family. thank you for these tender articles Gentle ,there is something of substance, for a persons memory to live on and inspire your many readers who may not have been to Ginas , but are reminded of what makes a place special. An inspiring portrait , of course now it is very poignant and will be of great importance as a documentation of these fine people. Rest in Peace, Uncle Philip. What a wonderful family! Bless them! Just read this beautiful tribute to Philip and of course Gina. It’s nearly midnight and my heart goes out to Gina and their family, I don’t know you but wish I did. Gentleness is a wonderful gift and a blessing to us all. found out yesterday 23/10/2012 that a beautiful old friend had died. in the 1970/80. and later with all the cab drivers. phill you will be truly missed . Thank you all for your kind words. The last few days have been hard since and the whole family are still in shock. We are trying our best to not let our emotions get in the way and give dad a lovely send off. He will be missed sorely but his humour and beautiful smile will always live on. have only just seen this on the internet I stayed with phillip and Gina whilst working in London in 1993=2004. Ginas Cherry pie was to die for and she always made me one to bring home. Phillip was a real Gent and I am sorry to hear he is no longer with us. My thoughts go out to all his family especialy Andrew and Jimmy who I met whilst staying there.